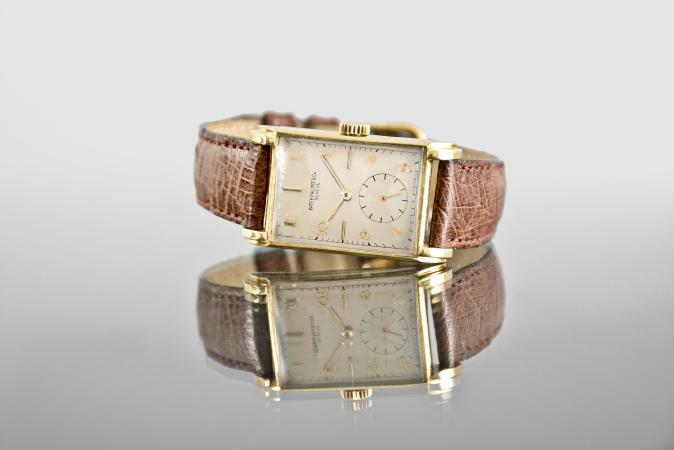 DESCRIPTION: Patek, Philippe & Co., Geneva, a man's rectangular gold wrist watch, 18 jewels, cal. 9 - 90, manual winding, adjusted, cotes de Geneve decorated nickel plate movement with lever escapement, cut bimetallic balance, gold timing screws and micrometric regulator in an 18 karat yellow gold case with burgundy ostrich strap, and arabic numeral silver dial with gold baton hands, serial #836972 (movement) , 635988 (case) , 22mm x 39mm, 33g TW, c1945, with associated Patek Philippe box. CONDITION:CASE: Fine scratches and minor dings; Case sides polished and with minor distortion; Plastic crystal with scratches; Crystal with gaps at ends; Precious metal content marked. 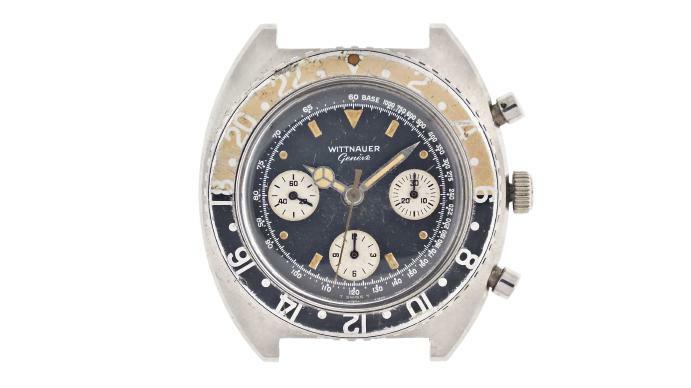 DIAL: Refinished; Bend, upper right corner; Numerals with bends. HANDS: With bends. MOVEMENT PLATES: Fine scratches and scuffs on plate; Bright work with fine scratches; Some screw slots with minor marring. MOVEMENT FUNCTION: Running order (winds, sets and ticks) . Box very good.